Sign Up To Talkingbass For FREE! Join over 40,000 members and R.A.I.S.E your Bass Game Today! FREE Ebook Downloads, Practice Tracks, Drum Tracks and MUCH MORE! 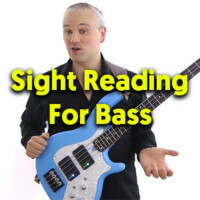 Two Ways Reading Music Can MASSIVELY Improve Your Bass Playing!! Sight Read On Bass in 5 Minutes?! Why Should I Learn To Read Music on Bass?